KINGSTON, Ontario — Taylor Hall has a pair of Memorial Cup MVPs and 158 goals logged on his junior hockey resume, which is why the strapping winger is the hottest name going into the NHL draft, which begins tomorrow night in Los Angeles. But let the record show that Kim Hall, the winger’s mom, should be credited with the soon-to-be-multimillionaire’s first assist. To hear Kim tell it, those scoring plays began about 15 years ago in Calgary, Alberta, as she stood in line at the local Safeway grocery store, her only child yet to pull on a pair of skates. It was there that the express checkout lane turned into the fast track to the NHL. “They had these little mesh bags you could buy with two tiny hockey sticks and a plastic ball,’’ Kim recalled last week. “We played with that down in the unfinished basement for, well, until Taylor played organized hock ey. “Every night after supper, it was, ‘Let’s go down and play!’ He loved it. I played goalie sometimes, used a broom for a goalie stick. Or I’d play out and we’d just shinny back and forth. Taped a net onto the wall with masking tape. Kim also was the one who bundled up her tiny slap shooter for a trip to a nearby rink to give him his first skating lessons. Raised in the far reaches of northern Ontario, she knew her hockey (“I never owned girls’ skates — ever’’). And while husband Steve was busy scratching out a living as a member of Canadian national bobsled team, she versed Taylor in what one day would prove to be the basic tools and skills of his profession. All these years later, either the Edmonton Oilers, pegged to pick first overall, or the Bruins, slotted at No. 2, will hoist up young Taylor (“Tee,’’ as he’s known at home) as their bundle of franchise joy. By all accounts, the 18-year-old sharpshooter, whose goal-scoring prowess led the Windsor Spitfires to back-to-back Memorial Cup championships, should be/could be the game’s next scoring sensation, leading one scout of an Eastern Conference club last week to compare him to the likes of Washington’s Alex Ovechkin and Columbus’s Rick Nash. “I’d put him a notch below those two guys,’’ said the scout. “He is that dynamic, that explosive. You’re talking about a game-changing, goal-scoring winger. “And to be honest, I don’t see how Edmonton passes him up at No. 1. Way too explosive. Way too dynamic. Another longtime NHL scout saw a direct Hall-to-Nash comparison, but kept Ovechkin installed as the game’s undisputed goal-scoring laureate. That said, he too believes that the Oilers “really have no choice’’ but to take Hall. “This has been the No. 1 kid for three years,’’ he said, noting that it was only in the Central Scouting Bureau’s last report that Tyler Seguin slipped ahead of Hall. “And when you are No. 1 that long, it’s only natural, people look at ways to tear you down, find your faults. A fraction of an inch taller than 6 feet and a sturdy 190 pounds, Hall could max out at about the same size (6-2) and playing weight (205) that his dad was in his Canadian Football League playing days. Over a plate of pasta and a salad — one that had him objecting to the tiny chunks of red pepper his mom included — Hall made it clear last week that he has no preference whose sweater he is wearing tomorrow night. “It will be fun, no matter who I go to,’’ he said. “It’s just such an honor to be drafted, to hear my name called. Like I’ve said all along, whether it’s an interview or if just someone in the street asks me, I’ve got no preference at all. His best pal and frequent golf partner, 19-year-old Dave McMullen, certified that with the official best friend’s stamp and seal. “Totally, 100 percent,’’ said McMullen, a defenseman on some of Hall’s youth squads. “He doesn’t care. It could be Carolina, Toronto . . . anyone. Born in Calgary, where his father-athlete competed as a bobsledder for more than a decade, Hall, contrary to many reports, did not move east to Ontario for a chance to play better hockey. Rather, both his mother and father grew up in Ontario and it was Kim’s desire to be back home, closer to her parents. Why Kingston? Because it looked good on their Internet searches, said Kim, and after a year of renting a place, they bought a small ranch-style home. The Hall home is minus any trappings one might expect to find in that of Canada’s most talked-about junior hockey star the last three years. The attached garage, chock full of suburban bric-a-brac, would need some serious de-cluttering to allow one of the family vehicles any shelter. Chief among the obstructions, what else but a street hockey net? In the cellar, which doubles as his bedroom, Taylor keeps his assortment of trophies and prized pucks. The display is hardly a shrine. The shiniest hardware, including the prized Memorial Cup MVPs, is perched unceremoniously on the sill of a window or crammed on the top of a stand that houses an antique sewing machine. 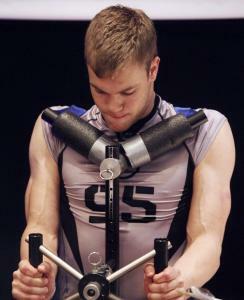 Like so many Canadian kids, Hall’s focus has been hockey, dating to his preteen years in Calgary. He was contacted by a number of US colleges, but never entertained the idea of playing NCAA hockey. He wanted major junior and major junior only, the route so many kids believe is the guaranteed route to the NHL, though too many often find the dream unrealized. “He had no interest in college,’’ said Kim, revisiting her son’s decision to play junior, which had him leaving home at age 15. “It was OHL [Ontario Hockey League] all the way. It would have been a waste of breath [pushing him to college]. Steve Hall, who continues to guide his son’s fitness and conditioning, was also the household rink manager for the 8-10 years the Halls had their backyard rink in Calgary. Make that the backyard, side yard, and front yard rink. As Taylor grew, so did the sheet, which included “Scott Stevens Tree’’ (a poplar) in the back and “Lindros Lane’’ on the side. Calgary was also where Taylor held his one and only job. Tomorrow’s No. 1 (or 2) pick in the NHL draft spent one summer, just before moving to Kingston, as a busboy at Il Giardino, the 130-seat Italian restaurant where his mother was hostess for some 10 years. Kim Hall, recalled Ciccaglione, was like many of the moms who have worked for him over the decades. All of them, he said with a laugh, have believed their son was headed to NHL stardom. Kim was adamant. But all the moms have been that way. The televisions at Il Giardino will be tuned tomorrow to the NHL draft. Customers and workers will gather around to see the onetime busboy get his moment at the top of the menu. Is he ready? “I’ve always done well against older guys,’’ he said, confident he can make the transition to the NHL straight from junior. “Saying that, for sure, it’s the NHL. Back in Kingston, and throughout the rest of Canada, the small mesh bags with the two plastic hockey sticks remain hot sellers all year. It’s always hockey season at the checkout counter.